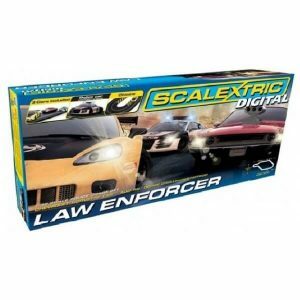 Scalextric Digital is suitable for older racers and larger groups. 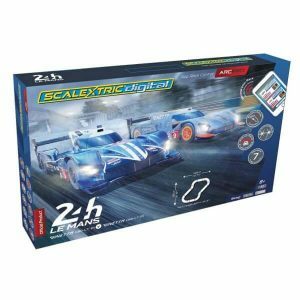 The cars features a programmable chip that is matched to its controller thereby allowing you to run multiple cars on each slot.Standard sets will run up to 4 cars (with additional controllers) and if you should need more than that there is an optional 6 lane powerbase that also features a lap counter and computer car control so that you can even race yourself!The other major feature of Scalextric Digital is overtaking. Special pieces of track, similar to model railway points, are activated by pressing a button as you approach them, if you time the button press correctly the car will then change lanes, allowing you to overtake or cut in front of your opponent. The more lane change sections, the more overtaking possibilities.